If you are looking for a purely enjoyable team to root for at the 2018 World Junior Championships in Buffalo, go with Slovakia. Not only will they be a proverbial underdog at this year’s tournament, but they have a wonderful blend of size, skill, speed,… you name it. The problem is that they just do not have enough of each, or at least not in great depth. Head coach Ernest Bokros found spots for his “two towers” – David Matejovic and Vojtech Zelenak – on his blueline. Good-sized snipers like Samuel Bucek, Adam Ruzicka, and Milos Roman all made the final cut, too. The Slovakians finished in eighth place last year in Canada, but with the players they have compiled on this particular roster, they should do at least as well in 2018. Preferably, and likely, even better. Slovakia is capable of playing spoiler and could give much more talented teams a bit of a fit. David Hrenak is the most promising of the three Slovakian netminders. A freshman for the Huskies at St. Cloud State University, he has played remarkably well during his first NCAA season. In six games this year, Hrenak has a measly 1.82 goals-against average to go with an outstanding .947 save percentage. Prior to playing college, he suited up for the USHL’s Green Bay Gamblers. In 33 games for Green Bay Hrenak put together an impressive 2.24 GAA and a .923 SV%. He will be Slovakia’s top goaltender at this tournament and should put forth an impressive performance regardless of the final standings come tournament’s end. Roman Durny and Jakub Kostelny will split the other duties for Slovakia. Kostelny plays junior hockey in Slovakia for his hometown team for HK Dukla Trencin. He is only 5-foot-9 and 154 pounds, and is the youngest of the three goalies. Kostelny has a 3.29 GAA and a .885 SV% in 13 games for Trencin. Durny also plays for his hometown team MHk 32 Liptovsky Mikulas, and has seen action with both their junior and top-level teams. With the HK 32’s regular team in the Slovak Extraliga, Durny compiled a 3.71 GAA and a .864 SV% in six games last year. Hrenak is going to have to be the cornerstone in net of the three. He is certainly capable of doing so too, as he has proven this both at the NCAA level and in American junior. Kostelny and Durny may see some action, but should serve mostly in backup roles. The Slovakian net is Hrenak’s. Vojtech Zelenak is 6-foot-5 and 225 pounds. David Matejovic is 6-foot-5 and 238 pounds. Any questions? These two “twin towers” may not be Bokros’ best defenders in Buffalo, but each is physically punishing in their own zone and can make opposing shooters wary of approaching the Slovakian goalmouth. Matejovic played seven games last year in the Alps Hockey League for Salzburg Red Bull EC. Zelenak played last year in Czech 2, which is the third-level ice hockey league in the Czech Republic. In 22 games for HC Litomerice and HC Benatky nad Jizerou, Zelenak had a lone assist. One of the defenders that Slovakia will rely most heavily upon is Martin Bodak. The 6-foot-1, 194-pound D-man plays in the WHL for the Kootenay Ice. In 30 games this season Bodak has registered a lone goal to go with 11 assists. He also had 26 penalty minutes, and may be the Slovakian defender with the most North American experience. Another defender who has tasted a bit of North American flavor is blueliner Michal Ivan. This season he has played Quebec Major Junior for the Acadie-Bathurst Titan. In 19 games, Ivan has scored a pair of goals and added seven assists. Samuel Bucek (Chicago Steel), Viliam Cacho (Dukla Trencin), Milos Kelemen (HKM Zvolen), Filip Krivosik (LeKi Hockey), Peter Kundrik (HK Poprad), Adam Liska (Kitchener Rangers), Milos Roman (Vancouver Giants), Adam Ruzicka (Sarnia Sting), Erik Smolka (Dukla Trencin) Samuel Solensky (Johnstown Tomahawks), Marian Studenic (Hamilton Bulldogs), Alex Tamasi (HC’05 Banska Bystrica). Offense and speed are Slovakia’s finest and deepest qualities. 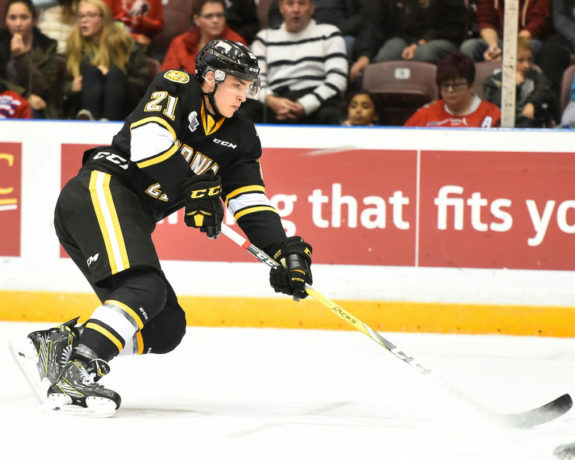 Having the Sarnia Sting’s Adam Ruzicka is proof enough of that. Selected 109th overall by the Calgary Flames over the summer, he is known for both his puck control and his large frame. At 6-foot-4 and over 200 pounds, Ruzicka is Slovakia’s most important forward if not their very best player, period. In 95 OHL games for the Sting, he has scored 45 goals and 40 assists for 85 points. Ruzicka arguably should have gone higher and in an earlier round. Marian Studenic was also taken by an NHL club during the 2017 draft. The New Jersey Devils nabbed him in the fifth round (143rd overall). Studenic has played the past two years in the OHL for the Hamilton Bulldogs, and is another player who will be expected to contribute offense to Slovakia. In 90 games with the Bulldogs, this six-foot winger has 31 goals and 29 assists. Studenic is a left handed shot that plays on the right side, and should be able to bring the needed scoring punch. Samuel Bucek is a sizable forward who has seen time in both the QMJHL and the USHL. He is known for liking to screen the goaltender, and his 6-foot-3, 192-pound frame allows him to do so. Currently with the USHL’s Chicago Steel, Bucek has seven goals and 11 assists for 18 points in 20 games. Last year for the Shawinigan Cataractes, he had 12 goals and 21 assists in 52 games. Slovakia’s defense and goaltending are too modest for them to be serious medal contenders. You do have to respect their size on the back end, though, as Zelenak and Matejovic are not the only two big boys that they have back there. Still, their goaltending and their D just do not equate to what the other teams at this tournament are putting forth. Where Slovakia gets the job done though is on offense. 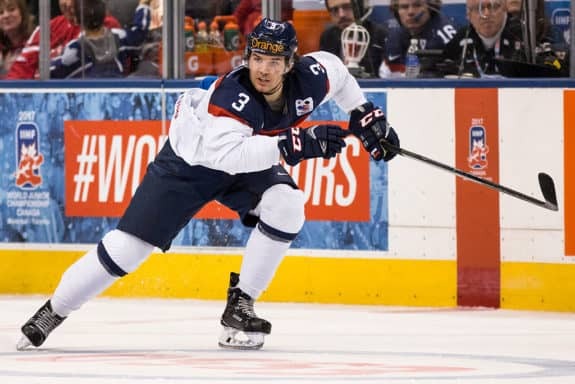 Now, they do not have the depth or the skill set that powerhouses like USA and Canada have, but they have enough of a scoring threat that you must respect them and not underestimate what they can do. Ruzicka, Studenic and Bucek can be especially potent. Look for Slovakia to finish sixth at best. Fifth if they are extremely lucky.